The purpose of this project, which was funded by the California State Water Resources Control Board (SWRCB), was to evaluate the compliance and wetland condition of compensatory wetland mitigation projects associated with Clean Water Act Section 401 Water Quality Certifications throughout California. This was done by selecting, reviewing and performing field evaluations for 143 permit files distributed across the 12 Water Board regions and sub-regions of the State. For each permit file we assessed the extent to which permittees complied with their mitigation conditions, including acreage requirements, whether the corresponding mitigation efforts resulted in optimal wetland condition, and if the habitat acreages gained through compensatory mitigation adequately replaced those lost through the permitted impacts. We found that permittees are largely following their permit conditions (although one-quarter to one-third of the time these are not met), but the resulting compensatory mitigation projects seldom result in wetlands with optimal condition. Depressional wetlands are the most abundant, yet most threatened wetland type in California. Despite their relatively ubiquitous nature, they are poorly characterized, and unlike streams, they are not subject to any systematic ambient monitoring and assessment in California. Consequently, decisions regarding protection, restoration, and management, such as issuance of Section 401 water quality certifications or prioritization of projects for wetland restoration grant funding, are usually made without the benefit of any regional context of condition, knowledge of predominant stressors, or rigorous documentation of reference conditions. 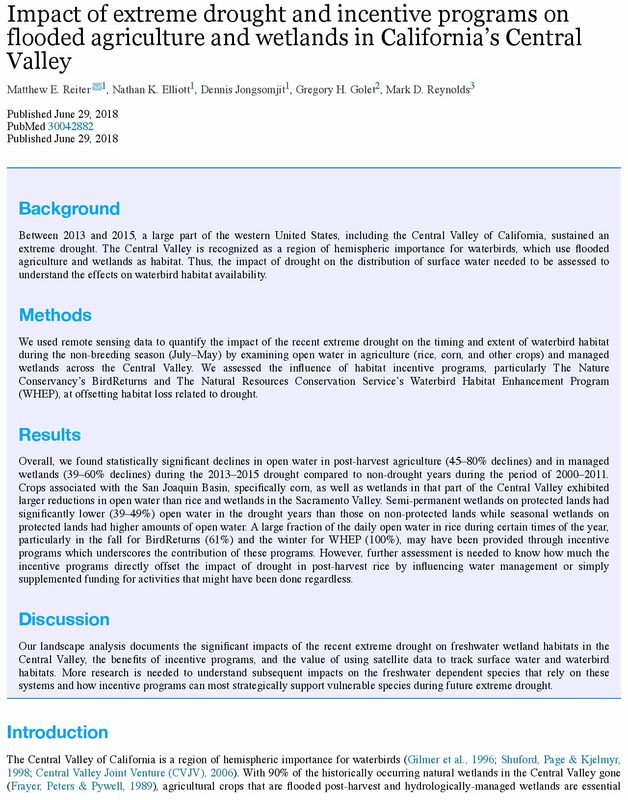 The goals of this study were to apply tools for ambient monitoring of depressional wetlands in the San Francisco Bay region to accomplish the following: 1) To evaluate the regional condition of depressional wetlands in this portion of northern California, and 2) To evaluate the relationship between condition and stress by sampling both local stressors (intensity of direct wetland use, water chemistry, and sediment chemistry) and landscape stressors (adjacent land use, flow diversions, and road density). Once achieved, these goals should establish the foundation for developing a robust ambient depressional wetland monitoring program. 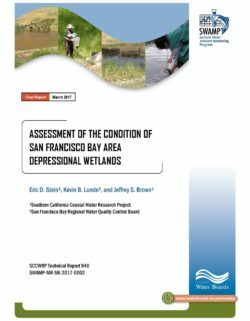 This study included perennial (have surface water year round) and seasonal (lack surface water for part of the year) depressional wetlands as defined by Brinson (1993) located within the boundaries of the San Francisco Bay Regional Water Quality Control Board. Depressional wetlands in this study includes both natural water bodies such as sag ponds and small lakes, as well as created wetlands such as abandoned or active stock ponds, aesthetic ponds, and irrigation/treatment ponds. 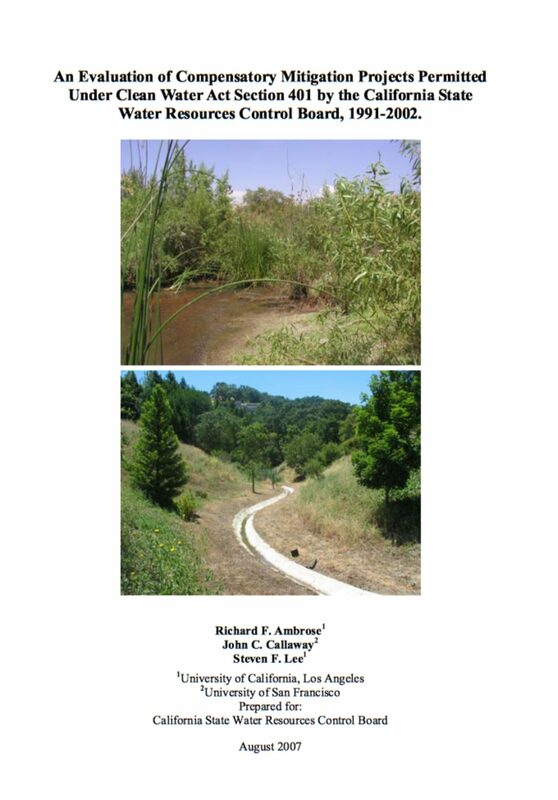 Wetlands were not considered for this study if they were concrete lined, marine influenced, wastewater treatment ponds, livestock wastewater ponds, riverine (i.e., dominated by riverine hydrology), dry, or vernal pools. 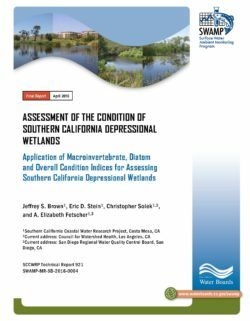 It is likely that a majority of wetlands sampled in this study would be considered waters of the State of California; the field teams did not perform a regulatory-based delineation of a wetland as part of this study. Thirty wetlands in the San Francisco Bay area were sampled during the spring of 2014, including both perennial and seasonal wetlands. The proportion of wetlands in the region considered “likely intact” (scores in the upper 50th percentile of the range found at reference sites) varied by indicator. Delta, where scouring of Gold-Rush-era sediment represents an ongoing source. Conversion of inorganic mercury to toxic methylmercury occurs in anaerobic environments including some wetlands. Wetland restoration managers must be cognizant of potential effects on mercury cycling so that the problem is not exacerbated. Recent research suggests that wetting-drying cycles can contribute to mercury methylation. For example, high marshes (inundated only during the highest tides for several days per month) tend to have higher methylmercury concentrations in water, sediment, and biota compared with low marshes, which do not dry out completely during the tidal cycle. Seasonally inundated flood plains are another environment experiencing wetting and drying where methylmercury concentrations are typically elevated. Stream restoration efforts using gravel injection or other reworking of coarse sediment in most watersheds of the Central Valley involve tailings from historical gold mining that are likely to contain elevated mercury in associated fines. Habitat restoration projects, particularly those involving wetlands, may cause increases in methylmercury exposure in the watershed. This possibility should be evaluated. 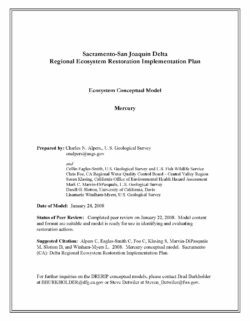 The DRERIP mercury conceptual model and its four submodels (1. Methylation, 2. Bioaccumulation, 3. Human Health Effects, and 4. Wildlife Heath Effects) can be used to understand the general relationships among drivers and outcomes associated with mercury cycling in the Delta. Several linkages between important drivers and outcomes have been identified as important but highly uncertain (i.e. poorly understood). For example, there may be significant wildlife health effect of mercury on mammals and reptiles in the Delta, but there is currently very little or no information about it. The characteristics of such linkages are important when prioritizing and funding restoration projects and associated monitoring in the Delta and its tributaries. 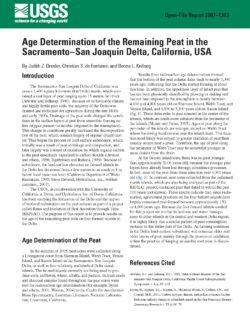 The Sacramento-San Joaquin Delta has immense municipal, agricultural, biological and industrial importance to the economy and livelihood of California and in turn to the United States. Plans to improve conditions in the Delta must address both human and biological communities. The region has been altered extensively over the past 200 years from land conversion to agriculture, fluxes in sedimentation rates, levee construction, and a completely re-plumbed network of waterways and hydrology (Thompson, 1957). Remnant, native riparian and wetland plant communities are almost completely removed and there is some question of whether the natural processes that create and maintain them can be restored (Mount and Twiss, 2005). Restoration implementation will be difficult considering the extent of alteration and complexity of both the natural system and cultural setting. The scientific approach to resolve these issues needs to reflect system complexity and represent the many potential response pathways that lead from proposed alterations. Development of conceptual models to understand these potential pathways is an important first step in understanding restoration implementation (and other management actions) in light of the complexity of the natural system and existing management scheme. The CALFED program is interested in restoring the Delta ecosystem to the extent possible. Riparian Vegetation (RV2) is but one of the natural systems of interest; others include fisheries, wildlife, and other plant communities. 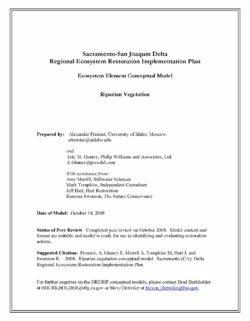 The conceptual model presented here deals exclusively with those physical, chemical, and ecological processes relevant to riparian vegetation. Riparian vegetation is important not only for biological conservation of the plant species themselves, but also the other flora and fauna species—and the physical and ecological processes—that depend upon riparian vegetation. Although the restoration of riparian vegetation as a component of a healthy riverine landscape has cultural and economic importance, these aspects are not included in this model. The conceptual model of riparian vegetation presented here is actually a sub-model of the larger floodplain processes/habitat model (Figure 1). 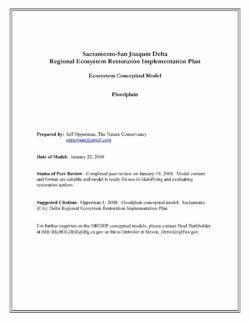 The RV Sub-model is general by design, and is intended to provide a framework for potential expansion or adaptation to more-refined models of individual species, habitats, and/or entire landscapes. Spatially, we focus specifically on the floodplain or land area beginning at the upper edge of the emergent vegetation zone, then moving up in elevation and inland from the water, ending when non-floodplain areas, open water, or marsh is encountered. 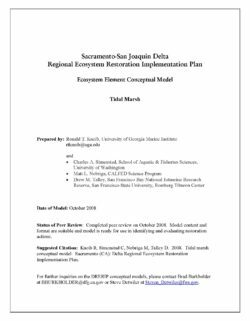 Together, the Floodplain model and the RV Sub-model can be used to analyze various “scenarios,” ranging from potential restoration or research actions, to water management decisions, to placement of bank protection at a specific Delta levee site. In addition, to highlight key differences in conditions that occur in the Delta, we present here two specific applications of the RV Sub-model that we generalize as a being dominated by tidal processes and another dominated by more riverine processes.